Nylon Y fitting for convoluted sleeving/tubing, allowing branching and break-outs to be formed in a wiring harness. The fitting has a hinged lid which is simply and quickly snapped closed over the sleeving, locking it in place. 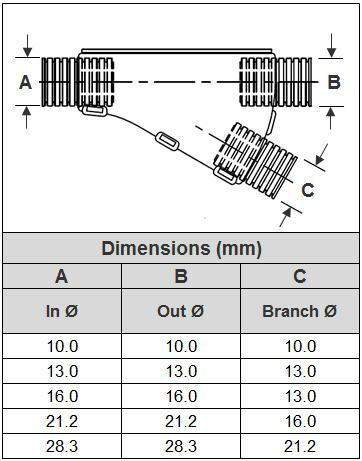 The adaptors to suit 10mm and 13mm OD sleeving have equal Y sizes, whereas the adaptors to suit 16mm, 21.2mm and 28.3mm OD sleeving have reduced branch sizes (please see further information below). Suitable for both un-split and split sleeving. Sold individually and available in various sizes to fit our range of convoluted sleeving.